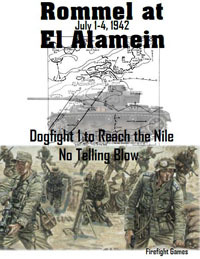 No Telling Blow is a simulation on the first battle near El Alamein from July 1st to 4th. It would be the first of several battles that were truly nasty dogfights as both sides were nearing their own breaking points for different reasons. Dogfight 2 would resume Rommel’s at-tempt on August 30th to break through to the Nile. Both sides by the end of June were in dismal shape. Both bloodied by vicious battles from Gazala, Matruh etc. Rommel felt that the momen-tum was with him, that he could pull off yet another Gazala. This time, crushing the British. For the British, their back was now against the wall. It had to be where the British drew the line in the sand and there would be no further rear movement. Failure here was not an option for them as Egypt would fall. However, both sides began the battle in a very much weakened, tired state. It was similar to equal boxers in the ring. Neither side knew how weakened the other foe was, but each hoped for some sort of ―Telling Blow‖ that would end the dogfight! Rommel’s DAK panzers had only 55 AFVs. The Italians had around 70 AFVs by some accounts. Combat effectives in his units ranged from 600 to 1600 men. Equally, the British armor units had been trashed by panzers. Although they had more tanks overall, most were non-operational and being repaired far to the rear. Their armor brigades averaged between 60-100 AFVs, with a good number of them being the superior US made Grant tank, which good easily demolish any panzer Rommel had. Haste makes waste, and Rommel, so eager to attack, did not wait for any reconnaissance reports and relied on old data that presented a view of the British incorrectly. Thus, his planning relied on data that would cause problems and making the sweeping movement, not sweep, as British made several last minute deployment changes that would create another nasty dogfight! Units represent Battalions/Companies. Each hex measures 1 mile from side to side. Each turn represents 8 hrs time.